My hair is getting long, guys! I know this may not be as exciting to you as it is to me, but it’s been a while since I’ve had enough hair to do the cute little updos I see all the time on Pinterest. And, if I’m being honest, Pinterest is three-fourths of the reason why I’m growing my hair out. The tutorial looks simple, and really cute. Now, granted, her hair is longer than mine… like, a lot longer. But mine is, you know… long-ish. The ponytail part I had in the bag. So far, so good. Yeah. Apparently you need lots more hair than I have. 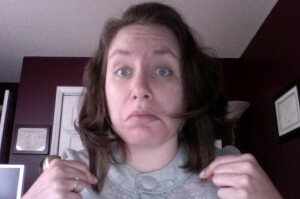 And hair that is not as weirdly bouncy as mine, even three days post-shampoo. I pinned, I sprayed, I really tried to get this to work. Alas, it would not. So let’s just get it over with and do the Nailed It thing, shall we? You could move the ponytail to the top of your head and have one of those cool 90’s waterfall looks…throw on some acid wash jeans, a lisa frank tye-dye shirt with a wolf on it (you know, a cutesy wolf with big eyes), and viola! Like magic, you look like a trailor trash hoe thats been locked in a cellar for the past 15 years! I’d repin that hotness! WHat I don’t understand about 99.9% of these hair tutorial on Pinterest is they show you how to do the style on someone else. How the hell does that help the person attempting to style their own hair? I can’t remove my scalp just to style the hair, and my husband has sworn off helping me do anything with my hair more difficult than braiding – and lord help him, when he attempts to braid it’s not pretty. “The last eighth I’ll let you guess about.” Challenge accepted. I’d put money on a frisky husband. As for the bun, at least you have thick enough hair to attempt one. 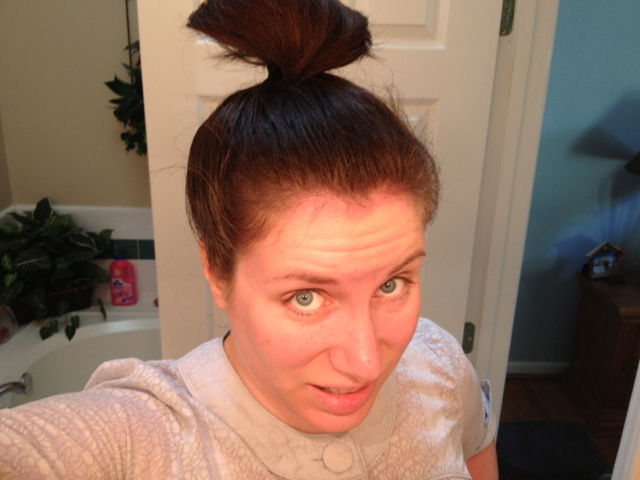 My hair is so fine, I can’t even make a respectable ponytail. My 8 year old son said, “No.” followed by shaking his head. I think the tutorial forgot to mention “have perfect hair” in the instructions. I tried this and mine, too, was an utter failure. I showed my son and he was like “that’s awkward, it looks nothing like the picture”. My hair is past my bra-line and I couldn’t pull this off! It just looked like a not-so-hot mess! 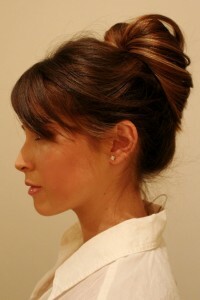 I’ll stick to my tried-and-true sock buns! !I also agree with the previous commenters on the husbandly inspiration for the hair growth. After much begging and pleading, I started growing my hair for my husband after having it short for several years and now it’s grown (haha) on me and I can’t bear the thought of cutting it again. The grown-out highlights make the original model look like she has a silky Tribble nesting on her head. I’m also concerned about this hair-do’s long term structural integrity for wedding-based activity levels, a girl needs to cut loose on the dance floor on her big day! On the bright side your pores look good! I hate to say it but I just tried this and…it worked. Like, looks exactly like the picture. I have mid back long hair. Its naturally wavy and holds styles well though. I think this style depends on the length of hair and the texture. I can send a photo if need be. I am not good at following directions for these type of hair-dos 🙁 i think you need really really long hair and lots of hairspray! I just tried it and it worked great….I think you just need a couple more inches. 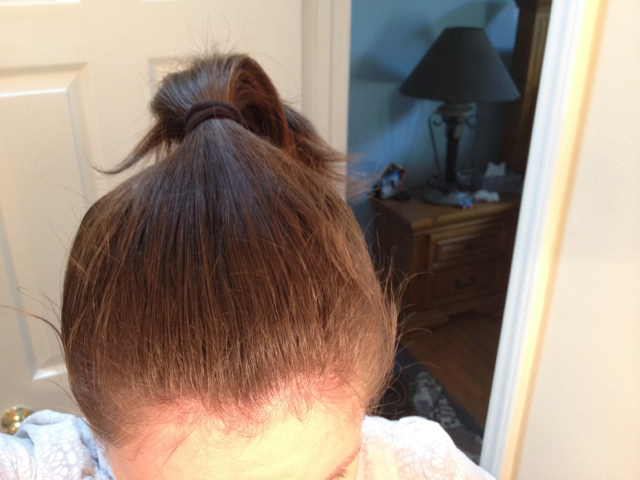 My hair is long, but very fine and many of these up-dos don’t work for me, but this one was a success.